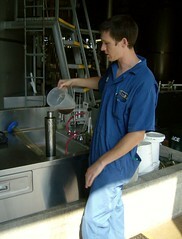 Sugar content of the unfermented mix is checked at Full Sail Brewery in one stage of the brewing process. Behind are the huge Mash Tun and Lauter Tuns into which the huge batch of beer is processed by hand and under close supervision over the first few days of the brewing cycle. Later the beer will move to the huge fermenting tank where yeast is added, breaking down the sugars into alcohol over a period of 10-14 days after which the beer is ready for bottling or kegging. Much of the beer crafting is done as part of the process of selecting and adding the hops to the mix. Full Sail uses mostly Oregon hops from the state's fertile central valley.